The performance of computer systems varies over the course of their execution. A system may perform well during some parts of its execution and poorly during others. To understand why a system behaves in this way performance analysts need to study its time-varying behavior. Fortunately, modern microprocessors support hardware performance monitors which enable performance analysts to collect time-varying metrics with relative ease. Unfortunately, even though modern microprocessors can collect hundreds of metrics, they can collect only a few of these metrics simultaneously. 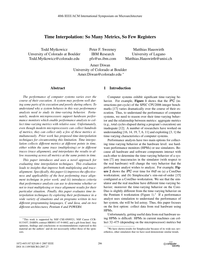 Prior work has proposed time-interpolation techniques for circumventing this limitation. Time interpolation collects different metrics at different points in time, either within the same trace (multiplexing) or in different traces (trace alignment), and interpolates the results to allow reasoning across all metrics at the same points in time. This paper introduces and uses a novel approach for evaluating time interpolation techniques. This evaluation leads to insights that improve both multiplexing and trace-alignment. Specifically, this paper (i) improves the effectiveness and applicability of the best performing trace alignment technique in prior work; and (ii) introduces criteria that performance analysts can use to determine whether or not to trust multiplexing or trace alignment results for their particular situation. Finally, this paper evaluates time interpolation techniques by exploring their performance in a wide variety of situations and on programs written in two different programming languages, C and Java, and on two different architectures, Pentium 4 and POWER4.